Sometimes a painting works out pretty much as you envisioned it. With my daily sketches that was a fairly rare occurrence because I was sketching my cats from life, and unless they are in a deep sleep they tend to move, including stopping what they’re doing and coming to me for attention because I’m looking at them. I had also placed some constraints on my daily sketches so I didn’t take all day and I didn’t try to create a masterpiece with every one. Fifteen minutes maximum, and I rarely went overtime. I had goals for different styles and media and encouraged myself to experiment. The practice sharpened my skills for all my art in a way nothing else could. Quick and simple watercolor paintings had always been on my list of things I wished I could do. I had worked out detailed illustrations and totally enjoyed painting each detail, layering colors, blending, but when it came to quick color studies sometimes my pastels just weren’t the right medium and I wanted to let the watercolor do what water does, find its own path, and work with that. So after a little over a year of sketches I saw these two in the blue northern light from the big casement window and, especially seeing Mr. Sunshine’s graceful curve, I felt a brush and the flow of water on the paper, and I felt confidence. Not to ignore Jelly Bean’s compact little napping shape—experimenting with creating shadows and shapes by giving the water varying amounts of pigment and a little bit of control was also on my list. Cats are usually simply happy wherever they are because if they aren’t, they leave and find a place where they can be simply happy. Looking at Mr. Sunshine’s graceful curve and watching the fluid motion of his bath I decided only watercolor would do. He and Jelly Bean were so cozy on the table by the window I knew they’d be there for a while and I could at least get a start, which I did, blocking them in as best I could. Even though Mr. Sunshine finished his bath and totally changed position I still finished the painting in one session. Bean was happily sleeping, sketching him is usually pretty easy. Winter Cats watercolor is 10″ x 6″ on smooth watercolor paper, available as a print on canvas or paper. 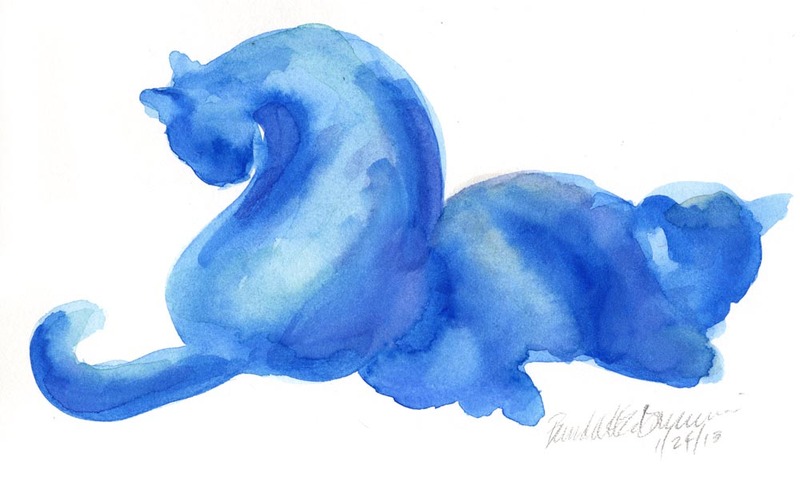 This entry was posted in cat artwork, original artwork, watercolor and tagged black cat, black cats, cat art, cat artwork, cat sketches, watercolor on January 29, 2018 by Bernadette.